The status quo is no longer working in Learning & Development. Rapid authoring, agile learning design, game-based learning platforms and mobile have made their way into our field, along with other innovations. Stakeholders who understand the impact training can have on the business are asking L&D to measure this impact based on real business outcomes. And then we have our learners, who increasingly demand engaging, interactive learning solutions that truly help them improve their performance. For nearly 20 years, we have partnered with our clients to design and deliver the right learning solutions for their training and performance needs. While every project is different, we have evolved a set of internal tools that help us analyze the current situation, design a single course or blended curriculum to meet the need and select the right technology. 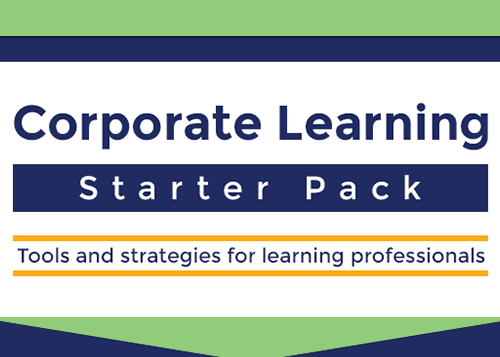 We’ve simplified these tools to create the Corporate Learning Starter Pack. Use these tools to jumpstart your planning process and create learning that meets and exceeds your goals! There is so much evaluation and planning that goes into training, from a simple course to a full curriculum. Your budget and needs will ultimate shape your decisions, and the tools we’ve created will help you organize all of that information together in one place. With tips, questionnaires, checklists, and more, you’ll feel better equipped to tackle your training needs. Needs Analysis worksheet: Ten simple questions that get you to the root of the training need. Self assessment for your training program: A chance to be honest about the current state of training in your organization. Template for planning your training program: A structured approach to sketching out the various learning solutions you must include. Technology evaluation checklist: A shortcut for evaluating what technologies should be included in your approach.